<p class="canvas-atom canvas-text Mb(1.0em) Mb(0)–sm Mt(0.8em)–sm" type="text" content="Los Angeles (AFP) – Marc Gasol and Markelle Fultz were reported to be on the move on Thursday as the NBA’s trade deadline expired with no deal for New Orleans Pelicans star Anthony Davis.” data-reactid=”22″>Los Angeles (AFP) – Marc Gasol and Markelle Fultz were reported to be on the move on Thursday as the NBA’s trade deadline expired with no deal for New Orleans Pelicans star Anthony Davis. 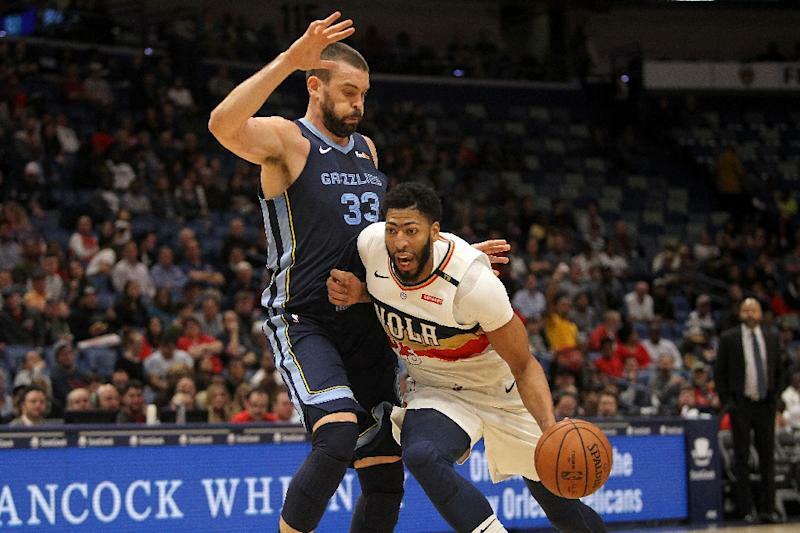 <p class="canvas-atom canvas-text Mb(1.0em) Mb(0)–sm Mt(0.8em)–sm" type="text" content="Memphis Grizzlies star Gasol was reportedly headed for the Toronto Raptors in exchange for Jonas Valanciunas, Delon Wright, CJ Miles and a 2024 draft pick, ESPN reported.” data-reactid=”23″>Memphis Grizzlies star Gasol was reportedly headed for the Toronto Raptors in exchange for Jonas Valanciunas, Delon Wright, CJ Miles and a 2024 draft pick, ESPN reported. <p class="canvas-atom canvas-text Mb(1.0em) Mb(0)–sm Mt(0.8em)–sm" type="text" content="Fultz, the number one pick in the 2017 draft, meanwhile was being offloaded by the Philadelphia 76ers to the Orlando Magic, sources told ESPN.” data-reactid=”24″>Fultz, the number one pick in the 2017 draft, meanwhile was being offloaded by the Philadelphia 76ers to the Orlando Magic, sources told ESPN. <p class="canvas-atom canvas-text Mb(1.0em) Mb(0)–sm Mt(0.8em)–sm" type="text" content="Milwaukee meanwhile aimed to bolster their charge towards the playoffs with the acquisition of Nikola Mirotic from the New Orleans Pelicans.” data-reactid=”27″>Milwaukee meanwhile aimed to bolster their charge towards the playoffs with the acquisition of Nikola Mirotic from the New Orleans Pelicans. <p class="canvas-atom canvas-text Mb(1.0em) Mb(0)–sm Mt(0.8em)–sm" type="text" content="Davis has been at the center of the window's most compelling soap opera, with the Los Angeles Lakers attempting to negotiate a blockbuster deal for the 25-year-old power forward.” data-reactid=”30″>Davis has been at the center of the window’s most compelling soap opera, with the Los Angeles Lakers attempting to negotiate a blockbuster deal for the 25-year-old power forward. <p class="canvas-atom canvas-text Mb(1.0em) Mb(0)–sm Mt(0.8em)–sm" type="text" content="The Lakers reportedly offered Lonzo Ball, Kyle Kuzma, Brandon Ingram, Josh Hart, Ivica Zubac, Kentavious Caldwell-Pope and two first-round draft picks in exchange for Davis.” data-reactid=”32″>The Lakers reportedly offered Lonzo Ball, Kyle Kuzma, Brandon Ingram, Josh Hart, Ivica Zubac, Kentavious Caldwell-Pope and two first-round draft picks in exchange for Davis. <p class="canvas-atom canvas-text Mb(1.0em) Mb(0)–sm Mt(0.8em)–sm" type="text" content="Meanwhile, the New York Knicks confirmed Thursday they had waived center Enes Kanter. Kanter had grown increasingly unhappy with reduced minutes this season and had been keen for a move, reports said.” data-reactid=”36″>Meanwhile, the New York Knicks confirmed Thursday they had waived center Enes Kanter. Kanter had grown increasingly unhappy with reduced minutes this season and had been keen for a move, reports said.